Dorothy Chapman was born on October 29, 1922. She was one of four children who grew up in Winnipeg, Manitoba, where her father maintained locomotives for the Canadian Pacific Railway. Dorothy was not only beautiful, but also clever. 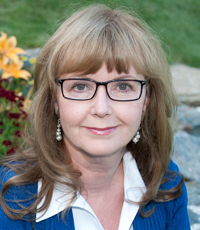 She finished high school at 16 years old and took a diploma in stenography before starting work at the head office of the Canadian Wheat Board. During her three years there, one of her duties was helping to map all the grain elevators in the four Western provinces, and for many years afterward she could remember the names and locations of every tiny community that had a grain elevator. 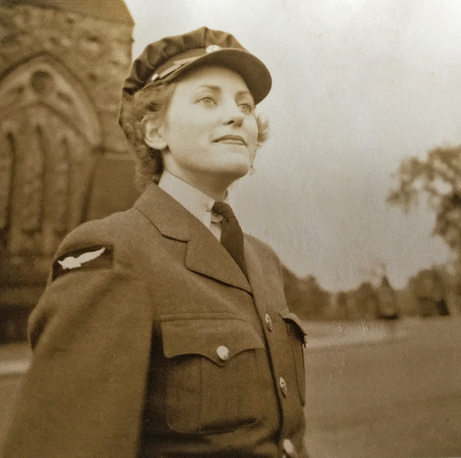 Encouraged by her boss, a former pilot in the First World War, Dorothy decided to join the Royal Canadian Air Force, Women's Division. She did her basic training at the Havergal College in Toronto, designated as Manning Depot No. 6 during the war, and then worked as an air force clerk at a Toronto base. 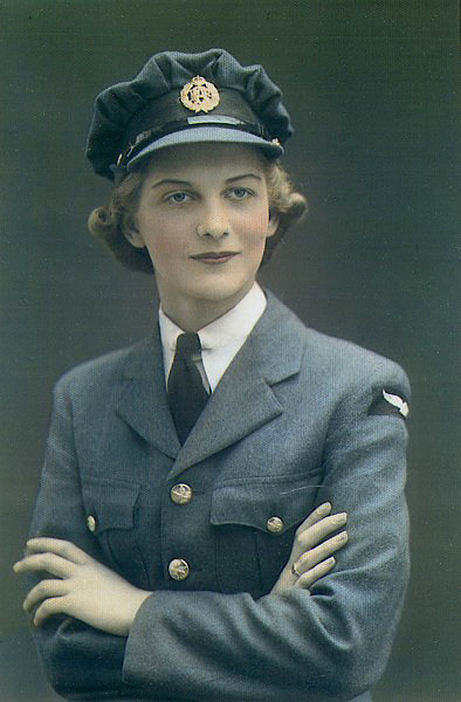 In both of these photos, Dorothy is wearing the earlier version of the Women's Division hat, a bulky thing modelled after the hats worn by members of the British Women's Auxiliary Air Force. Later it was changed to a trimmer version. To read more, click here: Hats, Helmets, and Headgear. Dorothy was there for about one year before being requested specifically by name for a position in Ottawa. With her background, it is not surprising that she was assigned to the map room at RCAF Headquarters, attached to the Directorate of Intelligence, where intelligence maps of various countries, such as Japan, were created. Dorothy’s role was to supervise a publication for pilots. Every airfield or landing place in Canada and the northern United States was mapped, so that pilots flying in this airspace could be guided down to the nearest safe location if they had to make an emergency landing. Dorothy excelled in her position and was promoted to corporal, and then to sergeant. Here she is shown marching on the right of the photo, her triple sergeant's stripes, or chevrons, clearly visible on her right sleeve. 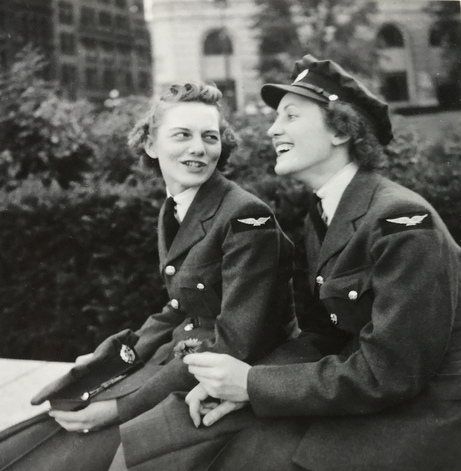 When talking to women veterans, I'm always impressed by the great spirit of companionship in which they served, and the lifelong friendships that they made. Here are a couple of photographs of Dorothy Chapman (predictably nicknamed "Chappie" for the duration of the war) and one of her many friends. Although she was a respected member of the air force, in an interview with The Memory Project, she did recall one incident where she almost got into trouble. One Sunday she and a group of WDs, as members of the Women’s Division were called, went on an organized bicycle ride from Ottawa across the river to Hull, Quebec. There Dorothy was arrested for cycling on a Sunday, and for wearing service shorts! These were regulation short pants issued by the air force, made from the typical blue wool. "About a week later, I got a summons to go to Hull. So I thought: 'To heck, I’m in air force headquarters; I’ll go down to the legal department.' I went down there and they said: ‘Was it an organized sport?’ I said: ‘Yes, and I can name the officer if you want.’ Happily, the air force looked after it and I never heard anything more." 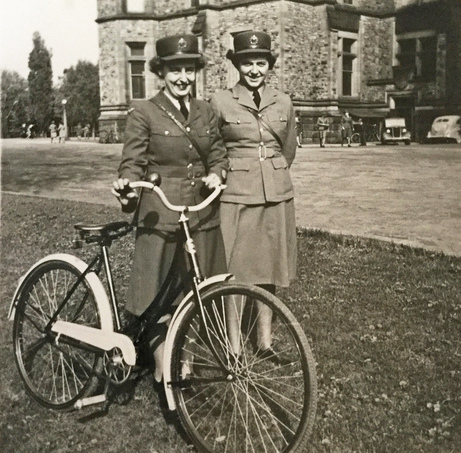 Here are a couple of Dorothy's air force friends with a bicycle typical of that era. Dorothy spent most of the war in Ottawa. 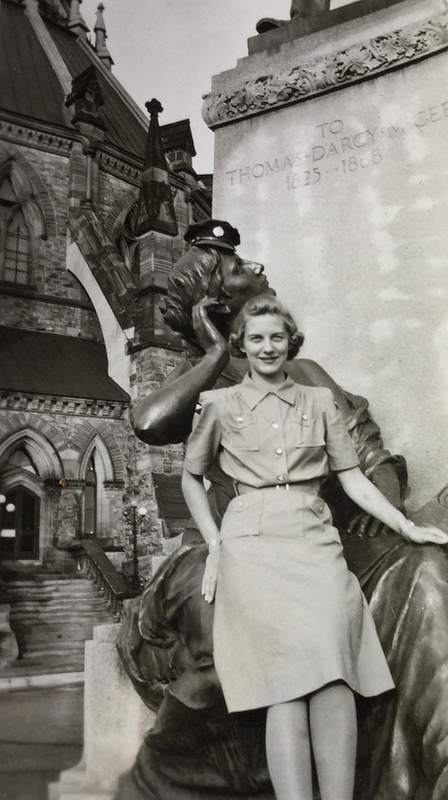 In spite of the sadness of those years, and the constant strain of serving in a country at war, she and her friends also had plenty of good times sightseeing around the nation's capital. Dorothy’s fun-loving nature can be seen in the following photographs. Here the figure of the woman behind her is wearing Dorothy's hat! This is the statue of Thomas D'Arcy McGee (one of the Fathers of Cenfederation), located behind the Centre Block on Parliament Hill. Here she is chatting up one of the RCMP officers, with the Parliament buildings visible in the background. I don't expect you could get away with this today! 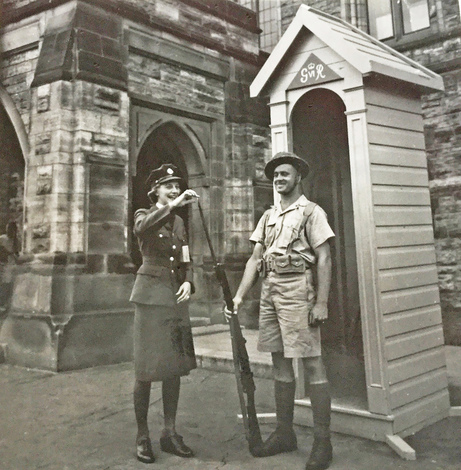 Here's Dorothy using her finger to test the sharpness of the bayonet on the guard's weapon, near the Governor-General's entrance to the East Block on Parliament Hill. 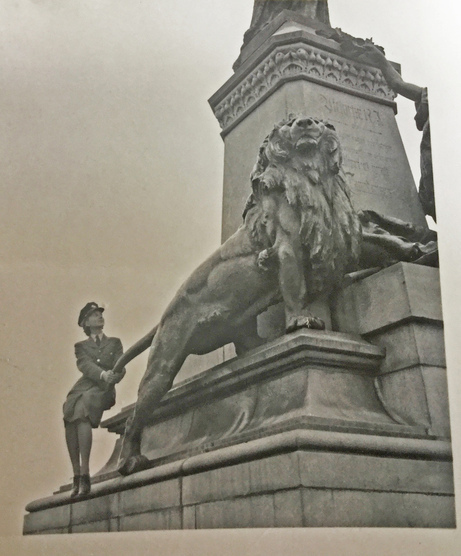 Here Dorothy is pretending to pull the lion's tail on the monument commemorating Queen Victoria on Parliament Hill, to the east of the Centre Block. 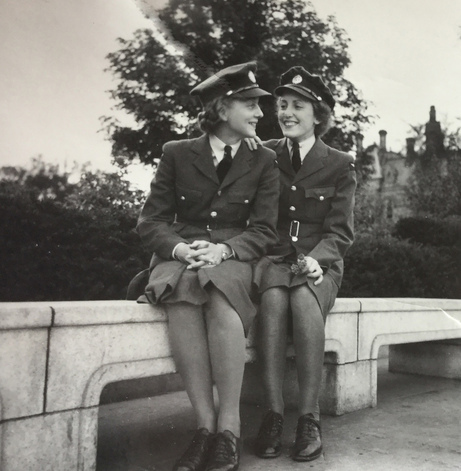 After her discharge, Dorothy moved to Chatham, Ontario, where she found work as a secretary. 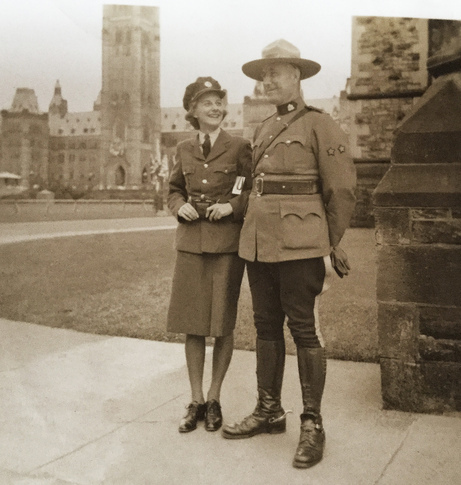 On November 10, 1946, the day before Remembrance Day, she was selling poppies on behalf of the Royal Canadian Legion when she encountered Don Garen, also an air force veteran. Born on June 29, 1924, Don had enlisted at 18 years old, the youngest of four brothers who all served in the RCAF. Don qualified as a pilot in October 1944 but fortunately was never required to serve overseas, since the war ended seven months later. “It was love at first sight,” Don recalled. 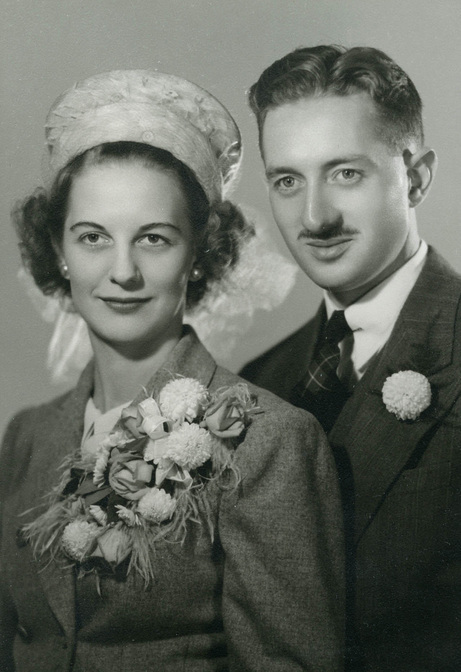 They started dating, and were married in Windsor, Ontario, on October 25, 1948. Dorothy wore a grey suit, with a pink hat and corsage. At the time of their marriage, Don was working at Chrysler Canada in the parts department. 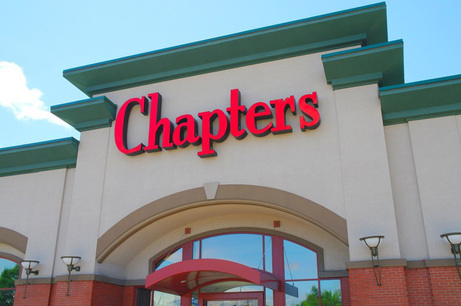 In 1956 the couple moved to Red Deer, Alberta, where a Chrysler parts depot was located; then back to Windsor in 1964. Don finally retired as the national parts manager in 1979, after 38 years of employment. Don and Dorothy had fallen in love with Canmore on their camping trips around Western Canada, and they built a house there in 1979. Don still lives in their original house, and Dorothy now resides in a long-term care facility. Both Don and Dorothy were hard-working volunteers in Canmore, and Dorothy served as the secretary of the Royal Canadian Legion for many years. They have two daughters: Donna of Mearns, Alberta, now retired from social work and teaching; and Sally, who owns a graphic and web design company called GoGo Graphics Design Services in Canmore. They also have three grandchildren and seven great-grandchildren. I took this recent photograph of them at Dorothy's care facility. 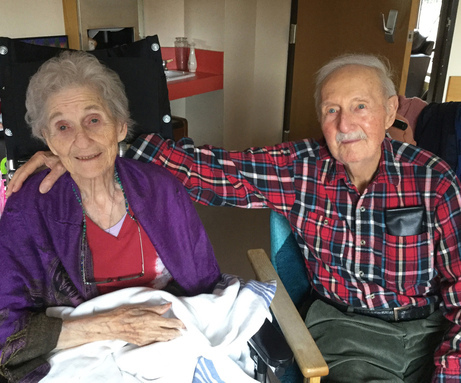 In October 2018, they will celebrate their 70th wedding anniversary. Dorothy and Don Garen, thank you both so very much for your service to our country and for your role in the Allied victory. Your sacrifice will never be forgotten. The Star Weekly was a Canadian newsmagazine published by the Toronto Star. 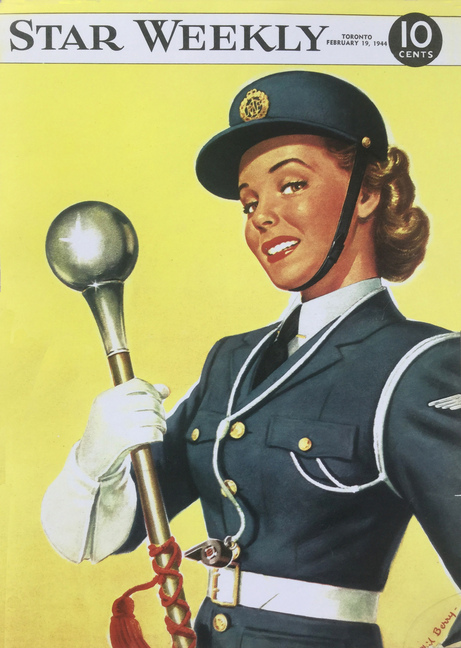 During the Second World War, a colour illustration with a wartime theme appeared on the cover each week. 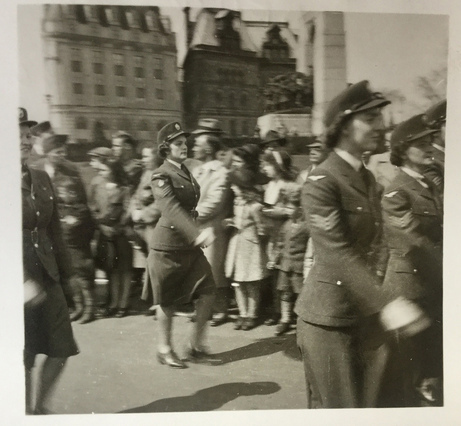 In honour of Dorothy Garen, here's an image of a marching member of the Women's Division, dated February 19, 1944. You'll notice she is wearing a later, more streamlined version of the WD cap. To see my entire collection of Star Weekly covers, click: Star Weekly At War. My new novel Wildwood was launched at the historic Pynelogs Art Gallery in Invermere on March 18, 2018. 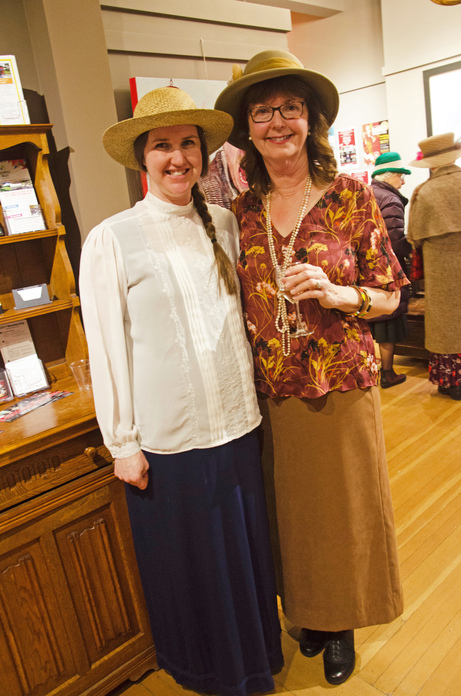 The event was a great success and about eighty people showed up, many of them wearing pioneer costumes in keeping with the book's historic theme. For a description of the book, click here: Wildwood. Along with the book launch, the Invermere Public Library hosted a Blue Ribbon Pie Contest! 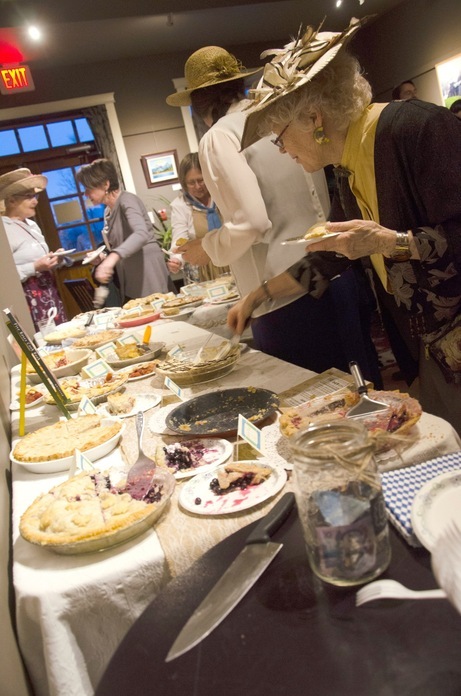 Twenty delicious homemade pies were judged, and then cut up for the crowd to enjoy. Twenty pies divided among eighty guests -- you do the math! The winner was a Strawberry Rhubarb Pie, baked by Brenda Marsman. 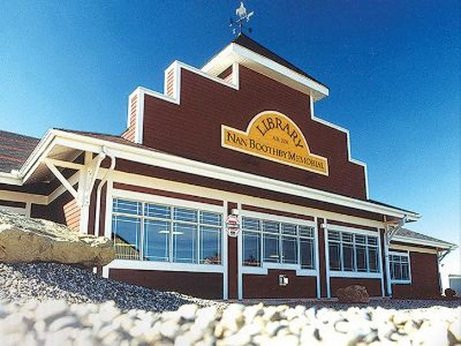 My thanks to the Invermere Public Library and the Columbia Valley Arts Concil for hosting my book launch, along with all the people in my little community for their ongoing support. In the next month, I'll appear at the four book events listed below. Visit my complete schedule for 2018 by clicking: Events. 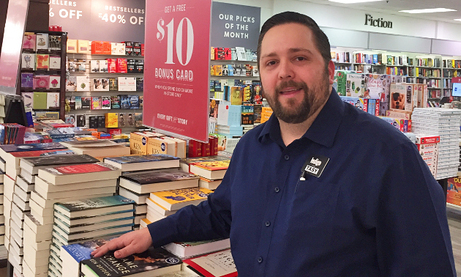 Coles manager Tasy Strouzas, shown above, has invited me to sign copies of Wildwood and Bird's Eye View at his Cranbrook bookshop. I look forward to seeing old friends and meeting new ones in my nearest and dearest small city. 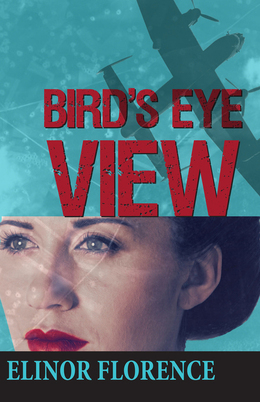 I'll be in Calgary to meet people and sign copies of my novel Wildwood, set in the mighty Peace River Country, and my wartime novel Bird's Eye View. 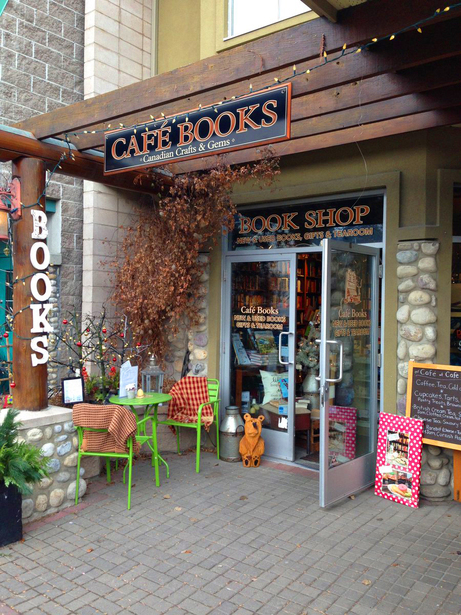 I'll be at Café Books, named one of Canada's ten dreamiest bookstores by Chatelaine magazine, to meet people and sign copies of my novel Wildwood, set in the mighty Peace River Country, and my wartime novel Bird's Eye View. Using old photographs, I'll present a one-hour slide show describing my historical research and telling some of my best anecdotes about both my new novel Wildwood, set in the Peace River Country; and my wartime novel Bird's Eye View, set in Saskatchewan and England.